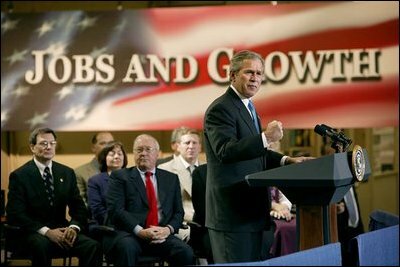 President George W. Bush discusses jobs and the economy at the Timken Company in Canton, Ohio, April 24, 2003. In the following month, the President signed the Jobs and Growth Tax Relief Reconciliation Act of 2003. "This law reflects a common sense economic principle: The best way to have more jobs is to help the people who create new jobs, and those are the small business owners of America," said the President during the signing ceremony.